It was a chilly February day and we soaked up the pre-match in Cardiff during the morning, having had a lift into town with Jamie’s parents. They are lovely people and were very welcoming to the 3 of us. Bizarely amid the rugby build up, we watched the Chelsea vs Cardiff City FA Cup tie live on the telly in a rugby pub beforehand! 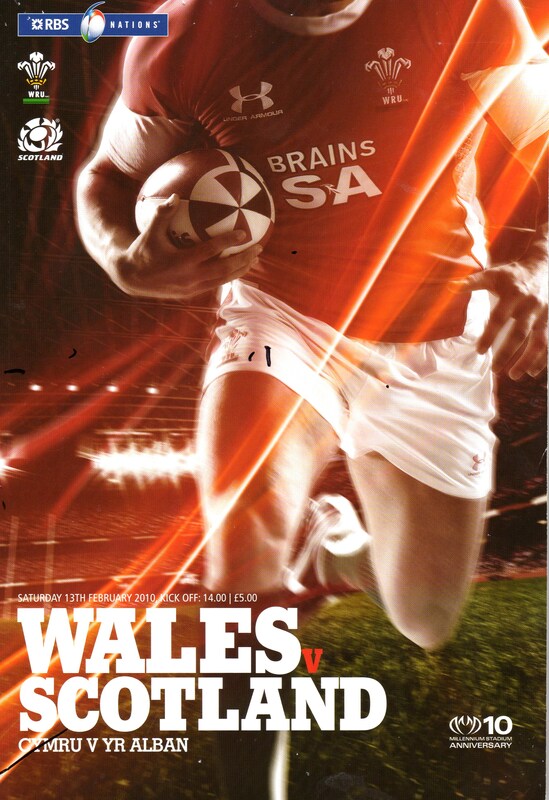 The rugby was typical style Wales that year – lots of tries but a leaky defence. Wales won with the last move of the game! After the game Huw and Doug were given passes to the Wales players’ family room – so they met all the players in a friendly and open atmosphere. Nick went for a drink with Jamie’s parents while Huw and Doug had food and drinks with the players and families! Huw and Doug were only 14 and 11 so James Hook’s Mum kept an eye on them..ahhhh. We were so lucky that day and they are good memories. Huw was so happy and there are some pictures of the programme and his autographs at the bottom of this message. The players they met that day and the autographs they got include many of the players who’ll be trying to beat France on Saturday and get to the World Cup Final. Players such as Leigh Halfpenny, Stephen Jones, Shane Williams, current captain Sam Warburton, Alan Wyn Jones and of course James Hook and Jamie Roberts. Huw enjoyed the rugby internationals and I know would be loving the semi final this Saturday. He enjoyed rugby at school and often said he’d wished he could play more. He’d have made such a good back row player – or a Centre. His physique and kicking ability would have been amazing on a rugby pitch. I m grateful to know Huw had a lovely day. In true Huw style, he wasn’t worried about meeting the players. He chatted with them and said they were ‘good lads’!! He and Doug also enjoyed the food in the family room 🙂 We drove back late on the Saturday ready for Hepworth footie on the Sunday morning.